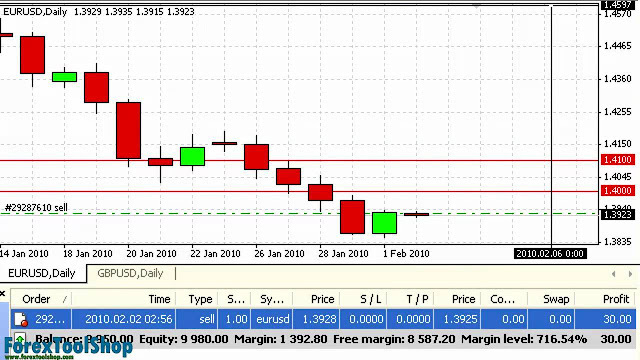 The forex chart is among the most basic tools in a forex trader’s arsenal. Simply put, it is a graph of a particular currency pair’s performance over a given period of time. Reading forex charts is essential to a trader’s business, so it’s important to know how to read them and understand what they mean. Every forex chart will be labeled with a currency pair: EUR/USD, USD/GBP, etc. Remember, all forex trading deals with different countries’ currency in relation to each other. The EUR/USD chart, for example, tells you how the euro and the U.S. dollar compare. You can find forex charts all over the Internet, on Web sites for forex brokers, tutors, and on other forex-related sites. Those are fine for glancing at trends now and then. But to be a serious trader, you need to have access to charts much more readily, without having to go to a Web site. That’s why trading software gives you forex charts, too (you need to have broadband Internet so you can be “always connected”). Obviously, if you’re going to be trading, you need to have convenient access to the very latest charts. With dozens of world currencies, there are far too many possible currency pairs for anyone to keep track of mentally. Forex charts show at a glance what any currency pair is up to, and good software allows you to save multiple charts as “favorites.” Naturally you’ll want to keep an eye on the charts representing investments you’ve already made, and it’s smart to have a few additional ones saved, too, so you can watch for trends in currencies you haven’t traded yet. You never know when a lucrative new opportunity is going to be revealed. 0 Response to "How to read a forex chart"